We believe that honest feedback is integral in helping us deliver the highest quality of surgical training. To encourage this, we ask all course participants and faculty members to give their views after completing a course via our online evaluation survey, which takes no more than ten minutes to complete. You will need to complete the online evaluation survey before you can access the certificate for your course. The link to the online survey will be emailed to you after the course, using the email address that you registered on the RCS website. Please note that the survey link will only be sent out once attendance registers from the course have been uploaded to our system; this can take several days after the course ends. If for any reason you have difficulty accessing this evaluation please contact education@rcseng.ac.uk. If you don’t complete your online survey within 30 days of the first email being sent to you, you will need to request a certificate. This involves completing a short form and paying an administration fee of £10 (see more information below). 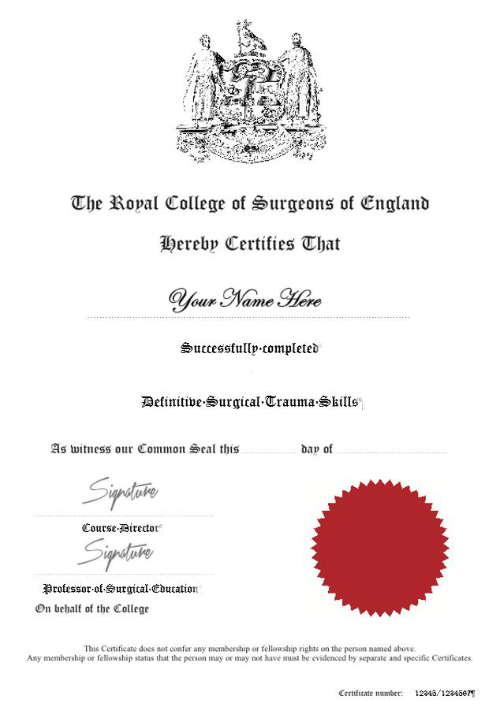 Course certificates are available to download via your account on the RCS website. Please note that your certificate will only be created once you have completed the online evaluation survey and it can take 24 hours for these systems to update each other. If you did not complete the online evaluation survey for your course, you will need to request a certificate. This carries a £10 administrative charge. To request a certificate, please complete this certificate request form. Successful course participants are able to purchase a luxury certificate by completing and returning a luxury certificate request form. Luxury certificates feature the College crest, embossed emblem, your name in calligraphy and signatures from appropriate staff/ faculty. Due to the individual attention that is required for luxury certificates, they can take up to 6 weeks to produce. RCS courses are designed to help you gain new skills and knowledge at every stage of your career. We believe in combining innovation and expertise to deliver the highest quality in surgical education.